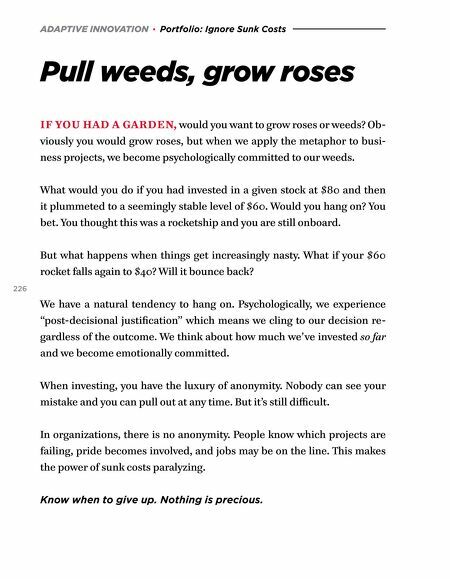 ADAPTIVE INNOVATION · Portfolio: Ignore Sunk Costs Pull weeds, grow roses IF YOU HAD A GARDEN, would you want to grow roses or weeds? 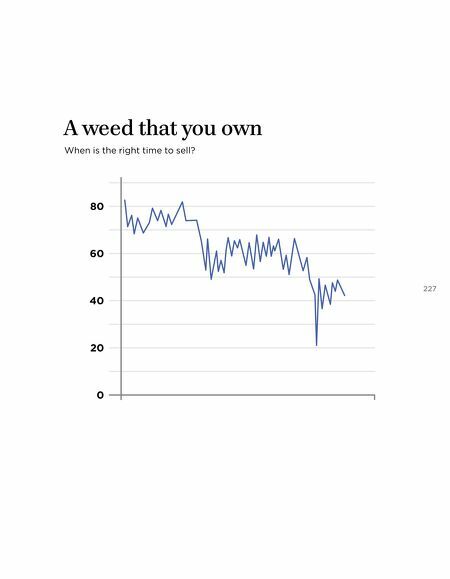 Ob- viously you would grow roses, but when we apply the metaphor to busi- ness projects, we become psychologically committed to our weeds. What would you do if you had invested in a given stock at $80 and then it plummeted to a seemingly stable level of $60. Would you hang on? You bet. You thought this was a rocketship and you are still onboard. But what happens when things get increasingly nasty. What if your $60 rocket falls again to $40? Will it bounce back? 226 We have a natural tendency to hang on. Psychologically, we experience "post-decisional justification" which means we cling to our decision re- gardless of the outcome. We think about how much we've invested so far and we become emotionally committed. When investing, you have the luxury of anonymity. Nobody can see your mistake and you can pull out at any time. But it's still difficult. In organizations, there is no anonymity. People know which projects are failing, pride becomes involved, and jobs may be on the line. This makes the power of sunk costs paralyzing. Know when to give up. Nothing is precious.